New evacuations were ordered Thursday afternoon for a neighborhood near an explosive 9,600-acre wildfire that raced through dry brush in Cleveland National Forest and spread toward homes. The Holy fire, which investigators said was started Monday by an arsonist, forced evacuations and cast a giant smoke plume over nearby communities. Estimated at about 6,100 acres Wednesday, the fire had burned through more than 9,000 acres Thursday morning. It is one of 12 major wildfires burning in California Thursday during what could be one of the state's most devastating years for fires. The fires have scorched more than 667,000 acres statewide and damaged or destroyed more than 2,000 buildings. New mandatory evacuations were ordered Thursday afternoon in Lake Elsinore for homes on the mountainside of Lake Street and southeast of Grand Avenue to Ortega Highway. The Holy fire has already destroyed at least 14 structures. Forrest Gordon Clark, 51, was arrested Tuesday and is being held in lieu of $1 million bail in connection with the fire. He was charged Thursday with several arson-related counts. The Holy fire was only 5-percent contained as of Thursday morning. During a briefing, Orange County Fire Authority Battalion Chief Shane Sherwood said the fire began "around and near" Clark's cabin in Holy Jim Canyon. He declined to comment on specifics that led to his arrest, other than saying witness statements and "physical findings" at the scene led to the belief Clark set off the massive blaze. "As far as exactly how it was started, we're still working through some of that evidence," Sherwood said. Volunteer Fire Chief Mike Milligan, who also has a cabin in the area, told the Orange County Register that Clark has long feuded with a neighbor and other cabin owners. He ran through the area last week screaming, and sent Milligan an email warning that "this place will burn," Milligan said. The fire was reported about 1:15 p.m. Monday near Holy Jim Canyon and Trabuco Creek roads, Orange County Fire Authority Capt. Tony Bommarito said. On Tuesday, the size of the fire had been listed at 3,399 acres, but it increased in size near the Horsethief Canyon area, authorities said Wednesday. It later jumped the North Main Divide dirt road, burning into the Lake Elsinore area, Bommarito said. Caltrans ordered the complete closure of Ortega Highway because of the proximity of the brush fire to the two-lane corridor. By 3 p.m., California Highway Patrol officers had implemented the closure from Grand Avenue in Lake Elsinore to the Nichols Institute entrance in San Juan Capistrano, covering about 28 miles. Crews continued aerial and ground firefighting efforts Wednesday, with 10 helicopters and seven fixed-wing aircraft assisting ground crews, who were working to build bulldozer lines, authorities said. With so many wildfires throughout the state, the firefighting personnel has been spread thin, Bommarito said. "Fire will continue to spread southeast and north with only limited spread to the west," according to a Cleveland National Forest statement. "The lack of resources for direct attack will allow the fire to spread into new areas, and align for strong head-fire runs and potential for an 'Elsinore' downslope event. 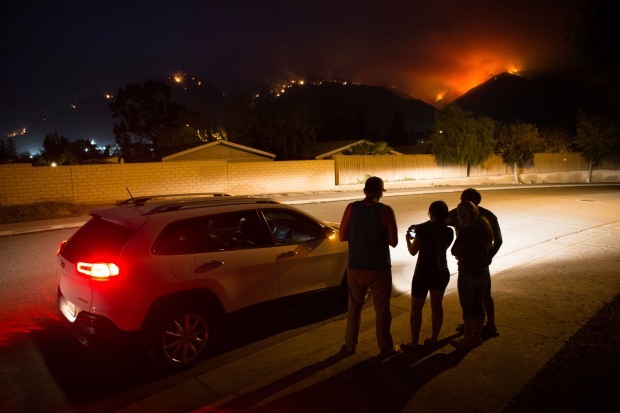 Firefighters had been particularly worried about the northeast flank, where the flames were a few miles away from homes, said Kathy Kramer, a spokeswoman for the unified fire management team led by the Cleveland National Forest and the Riverside branch of Cal Fire. 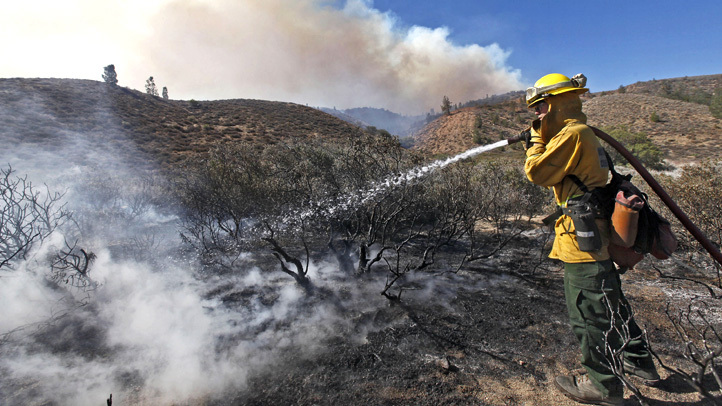 Weather conditions with temperatures exceeding 100 degrees and relative humidity below 15 percent lent themselves to conditions conducive to extreme fire behavior as well as heat illnesses for the firefighters, the U.S. Forest Service said. Small animals can be taken to Animal Friends of the Valley at 33751 Mission Trail in Wildomar. Information is available by calling (951) 674-0618 between 8 a.m. and 4 p.m. or (951) 506-5069 between 4 p.m. and 8 a.m.
"This is a monster," Spitzer said. "Who would go out with low humidity and high winds and the highest heat temperatures this time of the year and intentionally set the forest on fire? ... He's literally destroyed our forest." Spitzer said the Holy Fire should be more appropriately named the "Holy Hell" fire. Humidity improved slightly Wednesday, but it was still a factor. 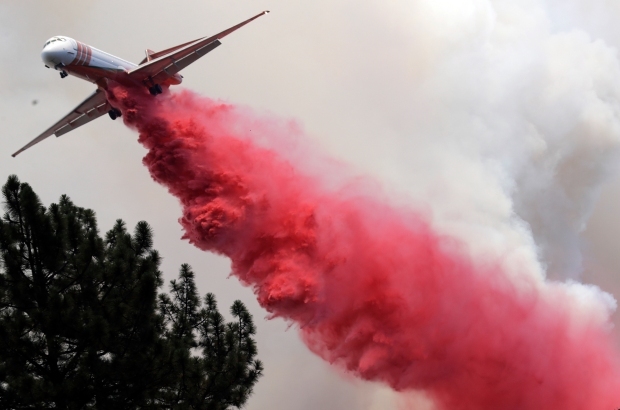 The steep terrain makes it difficult for fire engines to get to some of the flames, so the major weapons against the blaze are the aerial water drops, officials said. Bommarito noted that the area probably hasn't burned since about 1980. The phone numbers for residents to call for information on the Holy Fire have changed, according to Cal Fire. The new numbers are 714-573-6200 and 714-573-6202.